Wedding is a most precious part of ones life and choosing right attire can be a overwhelming job.There are so many online shops provide best quality wedding gowns. Before considering anything you have to understand that which kind and style of gown will flatter your figure the best. So today I'm going to introduce you with MILLY Bridal Shop. A shop sells best quality wedding gowns 2014 in just under $300. They are rocking with hundreds of wedding dresses and prom essentials, this site is the best place to find trend-led wedding and events gowns at affordable prices. Aimed at fashion forward designers, MillybridalShop offers the very latest styles in wedding and prom gowns for people that love keeping their look on-trend and affordable at special occasions. The reason for sharing about Milly bridal dresses is their affordable price as not everyone in the world can spend 2000 for wedding attire. 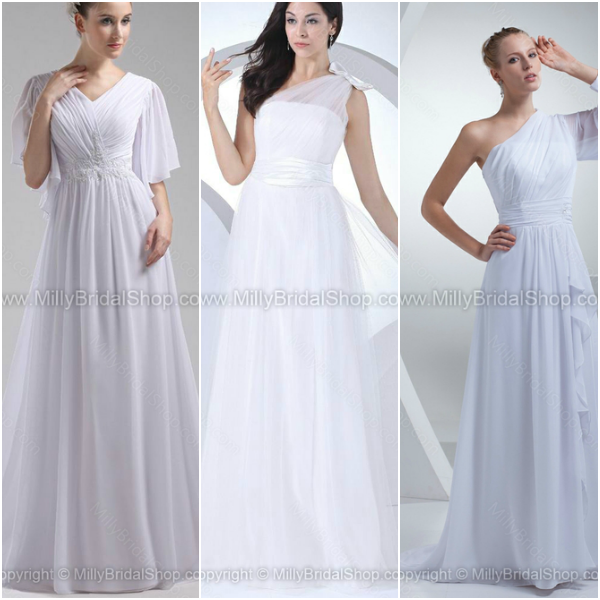 Millybridalshop is a best place for the girls are low in budget. There are many styles are available like, A-line, Ball Gown, Princess, empire, sheath, column, trumpet and mermaid. I personally like the princess style with lace fabric They are expert in making bridal gown and own almost every kind of fabric. Beside bridal dress they also deals in bridesmaid dresses, flower girl, prom dress and event dresses in very reasonable price. I'm sharing some of my favourite dress hope you like them. The second dress look gorgeous! These are so simply elegant, very pretty! Have a great week doll!